Reading the promo material for Russkaja you can anticipate the unusual. The group of Russian and Ukrainian émigrés settling in Austria and starting the band there, pursuing something they dub “Russian Turbo Polka Metal”. Intriguing in and of itself. The biosheet describes this style as a concoction of thrash, funk, pop, jazz and world music. To be honest, I was salivating over it, expecting the next, now Russian, incarnation of Diablo Swing Orchestra. And those who read my reviews of that phenomenal Swedish collective know how I can be taken by the genre mixture. Sadly, Russkaja is not Diablo Swing Orchestra. Not that they can’t be, that question remains unanswered, but on Energia!, at least, they chose not to be. Rather than present a classy and twisted version of the funky side of metal, the album is somewhat trivialized and simplified underground pop, although produced in a heavier style and using an interesting brass and violin passages. That was the first impression, anyway, Energia! is Russian gang music brought to foreign masses in the form of accessible sounding kitsch. Perhaps that was exactly the intent. Song after song, Energia! utilizes simple tuts-tuts-tuts rhythm section settled somewhere between authentic folk and some crazy Russian modern discotheque. Title track is certainly playing out that way and the jazzy military march of Radost Moja becomes a full blown Great Circus Parade. Bouncy breakneck off-the-wall Autodrom is the closest this music ever comes to thrash, although Dikie Detji has some distortion buried deep in its crazy chardash Hungarian motif. The songs, in fact, are made so accessible and inoffensive, that you can’t help but to leave Energia! in your player, and then, with time, you begin enjoying the catchy nature of this compote, the fun Russkaja players are having and the ironic nature of their tongue-in-cheek lyrics (although if you do not understand Russian I fail to see how you can appreciate the sense of humor obviously present in the lyrics, Barada and Surrealnaja taking the cake in that department). Multiple listens also provided me with the direct references and associations for just about every track on the album. Autodrom borrows pretty openly from Khachaturjan’s Sabre Dance, Istanbul does not necessarily have the Mediterranean feel, but instead projects a Georgian/Abkhazian Ostap Bender. Singing about Georgian wine then, Kartuli Vino instead goes for the Jewish Odessa quarters of 7:40 tune, only to end with something rather Chenghiz Khan-like. Barada and Ajajaj would be Willy Tokarev and Mikhail Shafutinsky, famous Russian singers emigrants, coming back to Russia in the early 90s singing to the wild gangs proliferating the country in those times. Violina Mia is a play on both cool Italian melody, but also the superpopular Russian movie Formula Ljubvi (Formula of Love) with its Italian gibberish lyrics laid onto the aforementioned melody. The song also does a superb Gypsy vibrato violin. Tanzi Tanzi goes not only for a disco dance move or two, title befitting, but takes its dance tunes from the Western Carpathian region. The closer Sorry is a sappy sugary ballad, stuck somewhere between Tina Turner and Alexander Malinin. I know I have laden my review with references rather not familiar to those who did not grow up in the Soviet Union/Russia. I would be curious to see how many I guessed correctly, if Russkaja musicians would care to read the review. The band leader and main vocalist Georgij Makazaria probably has some Caucasus Mountains region blood in him, and it shows, both in the melodic overtones, sense of humor and overall flair of Energia! 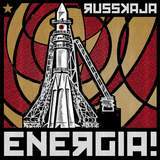 Also from the Caucasus probably comes the interesting brass instrument potete Russkaja makes very good use of on the title track, Autodrom, and throughout the album. In the end I was very split-minded about Energia! While finally convinced by the overall catchiness, some creative instrument use and playful lyrics, I could not get over the case of unfulfilled expectations and exaggerating some of the advertised wares. Then I did the unthinkable, I gave the album to my wife, because she watches a lot of Channel 1 Russian satellite TV, and that is where I think Energia! belongs, with the not-so-expensive Russian TV shows, rather than with metal festivals. With zero feel for metal, my wife further disseminated the album among the local Russian enclave. Hey, we got the word out about Russkaja where the band will probably be most successful, as somehow I still see it having a limited appeal among targeted audience. From this standpoint, consider the Soviet roots in me having added 10 points to the quote, which otherwise would have been lower.